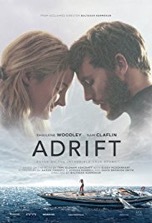 Based on an incredible true story, Adrift recounts the harrowing tale of how Tami Oldham (Shailene Woodley) kept herself alive for 41 days on the open sea. A romance/survival movie, the story bounces back and forth in time between terrifying present and torrid past. Months before she finds herself stranded at sea, Tami meets and falls in love with Richard Sharp (Sam Claflin). The two adventure-seekers decide to sail around the world together and unwittingly steer right into one of the worst hurricanes in recorded history—the shot of the small boat climbing the giant wave looks like it was borrowed from The Perfect Storm (2000). Woodley excels in a physically and emotionally demanding performance. It’s been reported that she subsisted on just 350 calories a day in order to look the part of an emaciated sea storm survivor. Whereas Woodley’s acting can’t be faulted, the screenplay by Aaron Kandell, Jordan Kandell and David Branson Smith didn’t give the star much to work with. Even though most stories of this kind, i.e. Cast Away (2000), have a dearth of dialog, Woodley’s lines largely consist of “Woo hoos!” or “No, no, no, @?&!” for the majority of the film. The biggest problem with the movie is that the romance subplot feels foisted on the audience and isn’t nearly strong enough to support this kind of lost at sea tale, which has been done many times before in cinema history: Lifeboat (1944), The Old Man and the Sea (1958), Life of Pi (2012) and Unbroken (2014) to name just a few. One disaster movie where the romance did effectively anchor the story was Titanic (1997). There’s an indirect reference to that film when Tina delivers a line that’s the reverse of Rose’s (Kate Winslet) “I’ll never let go, Jack.” In the end, the movie’s predictability holds it back from having a greater impact. As things stand, Adrift has joined the ranks of inspiring, yet standard and safe, biopics.